Weekday Kids at First, Inc.
We offer quality childcare for families who live or work in the Richardson area. The Child Development Center opened its doors for an all-day children’s program in August 1990. Licensed by the Texas Department of Family and Protective Services, we are routinely inspected by the state licensing offices, fire and health departments. Weekday Kids provides a nondenominational chapel service for children two years of age and older. This includes singing, a story, and prayer. FUMCR's Director of Children’s Ministry conducts this monthly service. Prayer before each meal is lead in the classrooms. Children receive morning and afternoon snacks, and a nutritious, well balanced lunch each day. All meals are served family style in the classroom. We encourage manners and self –help skills. The Child Development Center does not serve any food containing nuts, peanut butter or pork. The Mother's Day Out program is a Christian-oriented childcare program designed to be of service to the community. Your child can enjoy having fun with other children his/her age in a loving, nurturing and safe environment. The Preschool, Kindergarten, and Mother's Day Out programs' 2019-2020 confirmation cards will be mailed to new families upon completing registration. Information about our parent orientation meeting and Meet the Teacher dates and times will be emailed to all families in early August. The first day of MDO, Preschool, and Kindergarten is Tuesday, September 3, 2019. Children participating in any 4-year-old program or Kindergarten will need to submit current hearing and vision results at the beginning of the school year. All students need to submit current immunization records. Our preschool is a Christian-oriented half-day developmental preschool program for children 2 1/2 years old through pre-kindergarten and follows the Richardson Independent School District calendar beginning the week of Labor Day and closing the third week of May. Classes are limited in size and divided according to birth dates. Body Rhythmics is a developmental program designed to develop gross motor skills within the child. It helps with neuromuscular balance and coordination, which are essential elements for reading, writing, spelling and number readiness. Children spend 20 minutes each day developing the total child through their own learned body controlled movements. 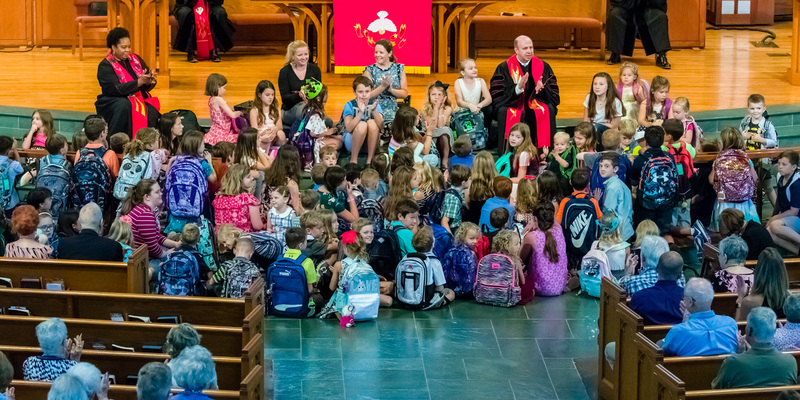 Preschool classes attend chapel once a month in which a minister or Children's Ministry director leads the children in a short Christian lesson. This program, 11:45 am - 2 pm each day, is offered to children involved in the Preschool and Kindergarten programs. Children bring their lunches and participate in a more relaxed classroom atmosphere for this period. Parents are welcome to visit classes. They are asked to provide snacks, assist with parties, and are encouraged to share their talents and hobbies. Parent/teacher conferences are held at least once a year. At least two evening family events are planned during the school year. Kindergarten classes include a developmentally appropriate curriculum consisting of language arts, reading, math, and science prepares the children for their future years in the elementary grades. Our kindergarten class is taught by Lindsay King, a former RISD 1st grade teacher and counselor. The program follows the Richardson Independent School District calendar beginning the week of Labor Day and closing the third week of May. Classes meet Monday - Friday from 8:45 - 11:45 am, with an optional Extended Day (see Preschool tab).